July 1st, Canada Day (at least in Canada! ), has me thinking about how America-focused the Americans are these days, even when it comes to global climate change. Paul Krugman wrote a great piece in the New York Times of 29 June 2009 called Betraying the Planet. Yet even Krugman falls into the Planet America trap: "[T]he deniers are choosing, willfully, to ignore that threat, placing future generations of Americans in grave danger, simply because it's in their political interest to pretend that there's nothing to worry about. If that's not betrayal, I don't know what is." What about betrayal of current generations of children around the world? What about betrayal of future generations of all nationalities? Why do American commentators feel the need to make everything climate change-related about America, when we all share one atmosphere? Are Americans really that incapable of thinking globally and acting locally? In a 29 June 2009 opinion piece by Michael Renner of Worldwatch, Turn up the Heat in the Climate Battle, we learn that "the Obama administration's chief climate negotiator, Todd Stern, has rejected calls for industrialized countries to cut their emissions by 40 percent below 1990 levels by 2020 [my note: we have to cut virtually 100 percent of our greenhouse gas emissions to avoid climate catastrophe]. He not only opposed such cuts as 'not feasible' for the United States, but strikingly judged them as 'unnecessary.'" "Not feasible" and "unnecessary"? What planet is Todd Stern living on? Last time I checked, the USA was on Earth. Canada is currently governed by a man who makes many of us ashamed to be Canadian at the moment. But the US? Their leader was all hope and "we can" before he was elected. I naively thought he meant "We can save the world." It seems more and more that what he really meant was "We can keep telling ourselves we're the greatest nation on Earth while we carry on being the most obstructive and destructive." And lest you think that I'm the only one thinking this way right now, check out 100 Ways America Is Screwing Up the World, a video of John Tirman, author of a book by the same name. Tirman, a professor at MIT, talks about the American "obliviousness to the rest of the world and its needs" and "individualism that says 'Why should I care?'" 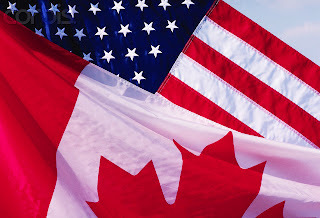 My wish today, on Canada's birthday, is for all Americans to use their own birthday — July 4th — as a time to look outward, onto the rest of the world, and to hold it in their hearts with care and concern and compassion.